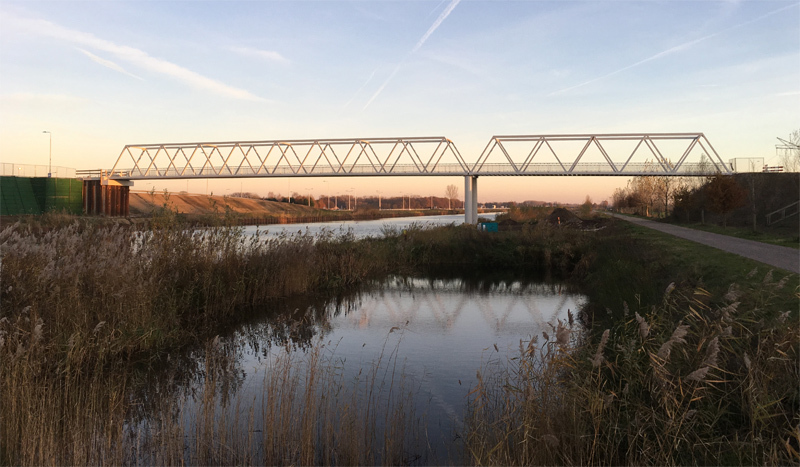 A new cycle bridge has been opened near the village of Berlicum over the Zuid-Willemsvaart (South Willem’s Canal). 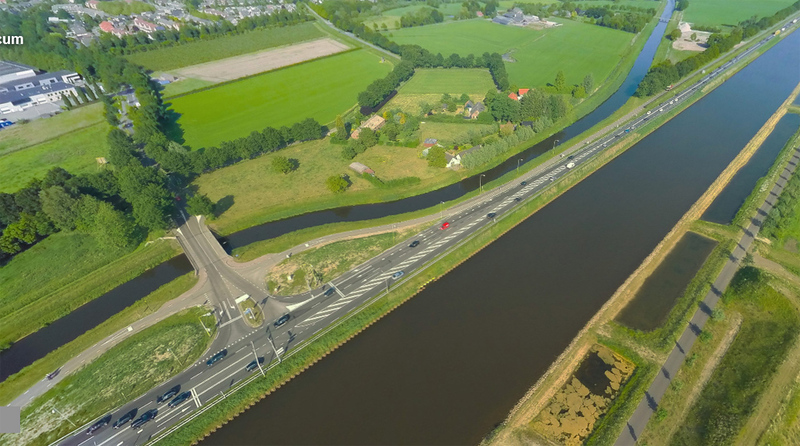 It not only offers a shorter route to the nearby village of Den Dungen, but also a faster and more convenient new cycle connection with the town of Veghel and the city of ʼs-Hertogenbosch. The 91 metres long cycle bridge over the Zuid-Willemsvaart between Den Dungen and Berlicum in a winter sunset. The canal was dug almost 200 years ago, from 1822 to 1825, as an alternative and shorter route to the river Maas. The villages of Berlicum and Den Dungen had been separated from then on, because there was never a bridge at this location. There had been a ferry in the past, but that never prospered. There are two bridges south and north, but they are almost 4 kilometres apart. That meant that even though the two village centres are very close (about 2.3 kilometres, as the crow flies), the shortest cycle route was no less than 5.3 kilometres long. With the new bridge, that has decreased to 4.7 kilometres. Still an unacceptable long detour, according to the Cyclists’ Union. To do something about that, they proposed the most logical shortcut, starting at the base of the access ramp to the new bridge, to the closest road south (the green line on the map). This turned out to be impossible to build. The field the green line would cross is a protected nature reserve in the old river branch of the river Aa, that used to flow here before the canal was dug. But another shortcut was in study, the red line on the map. 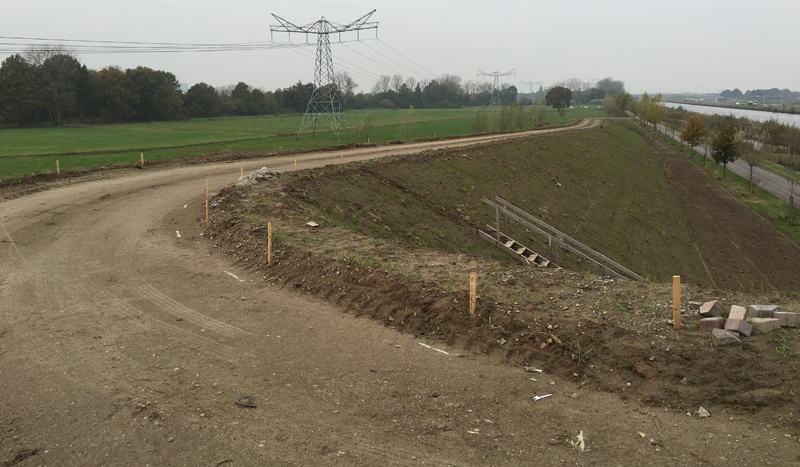 The council of Sint-Michielsgestel unanimously voted to build this shortcut in January 2015. Once it is built, it will shorten the total cycling distance between the villages with another kilometre to 3.7 kilometres. Especially children from Den Dungen, who go to schools in Berlicum, will benefit a lot from this in the end alost 1.6 kilometre (1 mile) shorter cycle route, thanks to the new bridge and the shortcut. Shortening the cycle route between Den Dungen and Berlicum was not the only reason to build the bridge. 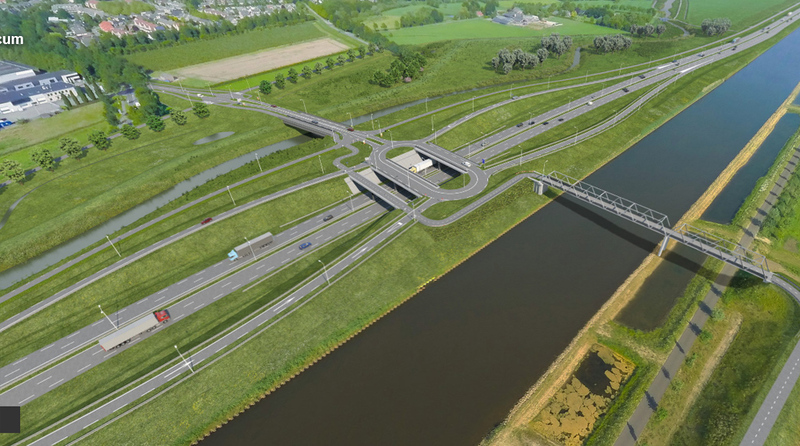 It is also a compensation for the loss of the direct cycle path next to the N279 from ʼs-Hertogenbosch to Veghel. This road used to be a main road with one motor traffic lane in each direction with a speed limit of 80km/h. Next to that road there had always been a two-way cycle path. 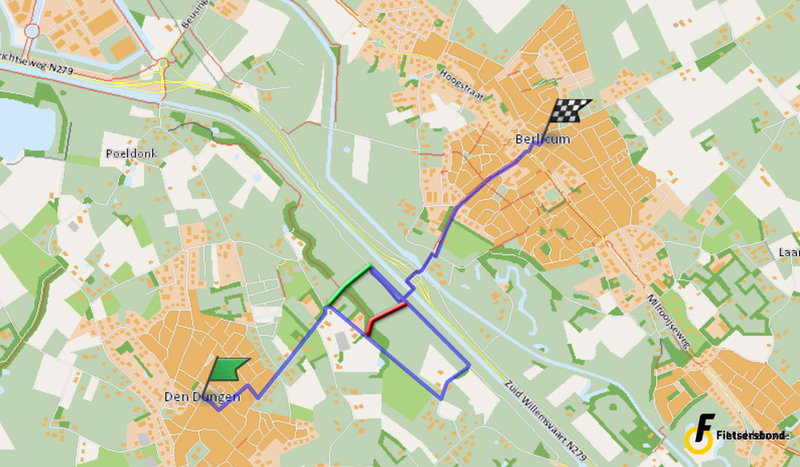 Even though it was not the nicest route, it was a very direct route from Berlicum to ʼs-Hertogenbosch. But the road has been reconstructed. It is now almost a motorway with 2×2 motor traffic lanes and a speed limit of 100km/h. A new rural road was built right next to it (for cycling and agricultural vehicles), but with a very large detour where the new Máxima Canal starts (which I showed you before). This meant another direct cycle route had to be found. It is also not so common in the Netherlands to have cycle tracks next to roads where motor traffic drives at 100km/h. The noise and the exhaust fumes close to such a road are very unhealthy and uncomfortable. After a consultation of stake holders, such as the Cyclists’ Union, a new fast cycle route on the other side of the canal was proposed and subsequently built. I already showed you this route in a post in March last year. It runs all the way from ‘s-Hertogenbosch to Veghel. It was built before the road was expanded so most people could already use it while the reconstruction was taking place. The N279 before the reconstruction, a two lane 80km/h road with a bi-directional cycle track/agricultural road right next to it.The river Aa is clearly visible. It was canalised when the canal in the foregrond was constructed, almost 200 years ago. more attractive, also without blinding lights from motor traffic. The bridge deck is about 12 metres above the water level. That means big container ships can pass it easily. 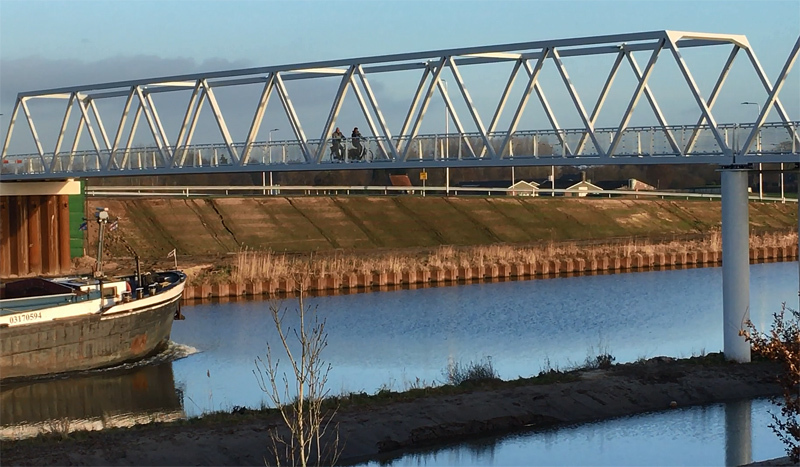 In March 2016, I accidentally filmed some early works for this bridge, when I rode from ʼs-Hertogenbosch to Veghel. An excavator was building the access ramp to the future bridge. In November 2016, the access ramp was almost finished. Before the bridge was opened in December, a layer of asphalt was put in place. It is clear, that to get to a level of 12 metres, the ramp had to become quite large. The ground works for the bridge had started almost a year ago. 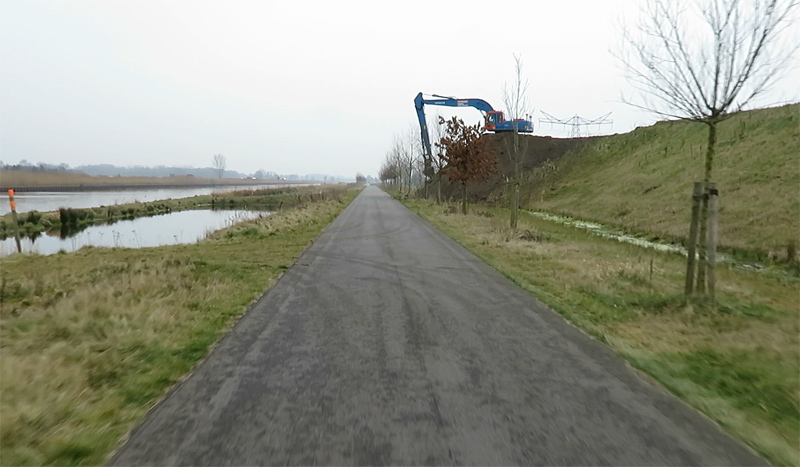 I even filmed an excavator at work in my ride to Veghel, in March 2016, without knowing that this was construction work for the access ramp for the new bridge. By mid-November 2016 everything was ready for the bridge decks to be placed. The decks were literally shipped to their final location from where they had been built. Since the canal is a main ship route the decks would be placed in one day, to minimise the nuisance. In the morning, the biggest part (58 metres long, 5.1 metres wide and 5.3 metres high) would be placed and in the early afternoon the smaller part (33 metres long and the same width and height) was scheduled. But when I arrived at one in the afternoon of a very foggy Tuesday the 15th of November 2016, I was very surprised to see both decks in place already. I talked to the men who were stopping cycle traffic and they told me it all went so smoothly with the larger first deck, that the workers postponed their break and placed the second deck before lunch as well. The building company had filmed the event so there is a time-lapse for you to see. After everything was completed, the bridge was opened mid-December 2016. The bridge decks are about 12 metres over the water level. A bit higher than usual, but the canal sees some very large container ships. That means the access ramp on the south side is quite high, but very easy to cycle on to. On the north side, the bridge passes a raised oval-shaped roundabout, which is part of the new semi-motorway exit to Berlicum. The bi-directional cycleway passes the roundabout at some distance. Since it is not part of it and this is outside the built-up area, people cycling must give way to cars exiting and entering the semi-motorway. Which seems like the better solution for this location. You only need to cross a single motor traffic lane at the time and there are very good sightlines. This means you have no trouble finding a gap in traffic. After passing the road the cycle route still stays at the same level and takes you to a new bridge over the River Aa. When you crossed the river it splits into mono-directional cycle tracks on either side of the road. The road then gently slopes in the direction of Berlicum. Although its not a bicycle only facility, below is a link to a story about a new bridge in the city of Los Angeles that includes a protected bikeway. I know of only one bike/ped only bridge in the city of Los Angeles which takes the LA river bike path over Los Feliz Blvd. There might be at least one additional bike/ped bridge built in the 10-year $60 million 12-mile mixed use path project along the LA river in the San Fernando Valley portion of the river. Preliminary studies that were recently presented floated an idea of perhaps continuing the path at a few points by going over a overpass rather than around or under it. Final designs will be presented this spring. What is the grade of that ramp up the bridge? Also I noticed there appears to be a flat spot on the ramp. Is there some kind of guidance for putting “rest” spots on such climbs? Hi Mark. How much did this bridge cost please? If I had known I would have told you. The cost are hidden in the total cost for the entire road reconstruction. Usually, when local authorities must pay it does get in the news, but not in this case. So I searched, but didn’t find it. My guess is every euro the bridge (and all bicycle infrastructure for that matter) cost the world saves 10 euros in reduced health care costs, reduced petrol costs and reduced air and noise pollution costs. Also, the happiness of the society is greatly increased and this encourages more overall productivity with a good attitude. Many bicycle bridges in The Netherlands and Belgium offer great views because of the ultra-flat land. You can see very far, like up to several kilometers in some cases. It’s a perfect scene when cows, sheep and windmills are in the surrounding fields! A flat Noord Brabant is a redundant statement. Those 60 km/h roads Mark, they’re quite nice, through the peaceful countryside with few cars (most of the time) that do not belong on those routes. I’d like to see more of those if you have the time. 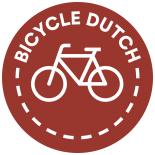 This entry was posted on 31 January 2017 by Bicycle Dutch in Original posts and tagged Berlicum, bridge, Motorway, Sint-Michielsgestel.